It also comes just days after the Obama administration confirmed it plans to file a lawsuit to block the law before it goes into effect on July 29. That suit could come as early as next week. For its part, the Mexican government said it believes the law, signed by Gov. Jan Brewer on April 23, will severely hurt its ability to do business with Arizona and the U.S. The briefing notes that Mexico is the third-largest trading partner with the United States and the second-largest buyer of American exports. Nearly 20 million Mexicans lawfully visited the United States last year, the filing said, and Mexican citizens spend about $7.35 million every day in Arizona alone. The government also said the law puts down a major stumbling block for comprehensive immigration reform, which both the U.S. and Mexico see as a necessity. Finally, the briefing compared S.B. 1070 to police actions targeting African Americans in the south before and during the civil rights era. The Mexican government said it believes bias and stereotyping will be an inherent part of enforcing the law, despite Arizona’s promise that it will not. “S.B. 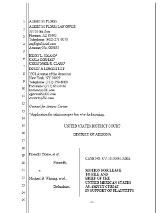 1070 gives local officers carte blanche authority to stereotype and to rely on the popular perception that appearances of “foreign-ness” are justifiable means for disparate treatment,” the filing said. What’s next, the Mexican drug lords petitioning to make drugs legal? What's next, the Mexican drug lords petitioning to make drugs legal? There is no reason that mexicans who travel legally into the state should have any fear, or anyone who has proper identification or paper work. The police are not out to round up hispanics left and right, they are there to protect their state, and the citizens of said state. This law is made to stop the cartels from bringing in drugs, to stop the illegal immigrants from draining the state funding and aide programs that should be used by citizens who NEED it.